Last week, it was reported that RTÉ spent almost €700,000 on providing the service. RTÉ HAS WRITTEN to the Minister of Communications saying it wants to reduce its Aertel service, which has been in operation for over 30 years, as its usefulness has now been “superseded” by technology. The service, which has been in operation since 1987, offers information on news, sports, weather and a host of other topics. Between 2014 and 2017, the service has cost €2.9 million to run but the national broadcaster now wants to redirect its efforts to online and mobile services. But, due to legislative constraints, RTÉ must gain the Minister’s consent before it makes a significant change to the service. Last week, the Irish Mail on Sunday reported that the Aertel service cost just shy of €700,000 to operate last year. In a statement to TheJournal.ie, an RTÉ spokesperson said that over 70% of this cost was for the transmission and distribution on the national digital terrestrial transmission and distribution service at the regulated tariffs. The cost of Aertal has remained relatively similar in recent years. In 2014, it was €740,073. In 2015, it cost €771,437. In 2016, it was €700,023 and last year it cost €690,628. Such is the costly nature of a technology that shows information that is now widely available in other mediums, RTÉ has said that it now wants to roll back its Aertel offering. Similar services in other countries such as BBC’s Ceefax, which was switched off in October 2012, have already migrated online. 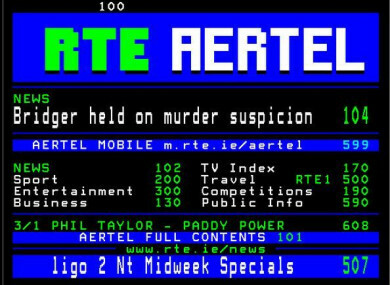 Aertel can already be found online, but RTÉ is now seeking approval to reduce its terrestrial offering. “If RTE wants to make any significant changes to a service or channel it is obliged by statute to gain regulatory approval and Ministerial consent,” the spokesperson said. RTÉ has written to the Minister indicating that we too now want to begin the process of reducing our Aertel service so we can redirect our efforts to online and mobile services. That process will take some time. In the meantime, RTÉ will continue to provide an Aertel service on Saorview and other platforms. According to official figures on its usage, however, the service is still quite popular. Kantar Media’s Target Group Index for 2017 put the usage of Aertel either on TV or online at 27% of adults, or 961,000 people. On a weekly basis, it said that 11.35 of adults, or 432,000 people, used Aertel. However, it was unable to provide a statistical breakdown on the numbers who use it just through the TV, or just through the internet. Email “Hundreds of thousands still use it - but RTÉ has asked Minister if it can reduce Aertel service”. Feedback on “Hundreds of thousands still use it - but RTÉ has asked Minister if it can reduce Aertel service”.